Just a Sandwich! | Delicious! Delicious! In one corner of the massive kitchen, a small kitchen table stands with two chairs. It is an old wooden table that could be found in any normal-sized home, but looks distinctly out of place in this house. Caryn sits at the table that is now covered with food magazines and the same weathered cookbooks previously seen on her own desk. She is intoxicated with her reading when she is startled by Mr. R. coming in through the back door. She looks up, unable to transition from her dreamworld into reality so quickly. Mr. R. passes through the kitchen without speaking to her. When the door closes, she exhales. The door to the dining room swings open again and Mr. R pokes his head in. I’m not in the mood for much dinner. He leaves as quickly as he appeared. Caryn reluctantly starts cleaning up the table, disappointed. She stacks the coobooks and magazines together. There’s no such thing as just a sandwich. 1. Place the chicken breast between two sheets of heavy-duty plastic wrap and pound to 1/4 inch thickness. Season with salt and pepper. 2. Melt butter in heavy skillet over medium-high heat. Add chicken and cook until lightly browned on one side (1-2 minutes). Turn chicken over and top with Asiago cheese. Cook until browned and cheese melts (another 1-2 minutes). 3. Toast focaccia halves in toaster. Brush olive oil on top halves. 4. 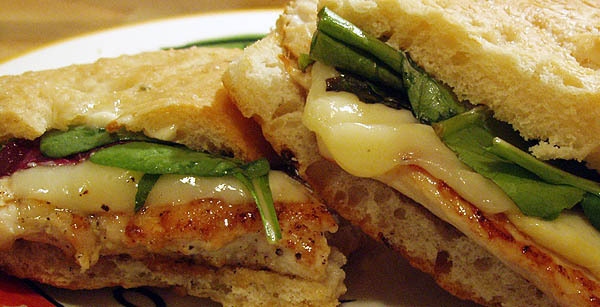 Cut the chicken into two pieces and divide between the two bottom slices of focaccia. Top with the greens and remaining focaccia. Now. These sandwiches look amaaaaazing! Must read on this Asiago cheese, never heard of it (yet). Thanks for visiting! Asiago cheese is most often found in its aged form, hard and gratable. However, I used a young, softer Asiago (Pressato) for these sandwiches. I love it in all forms…it is especially good baked into bread. This looks really yummy. I think I will try to make it myself. what a lovely photograph i love to see food photography and i find that your blog has the greatest photos i have seen congrats to you….